Turkey’s PM Binali Yildirim has announced that some 2,839 soldiers, including high-ranking officers, have been arrested after an attempted coup that is now over. At least 161 civilians have been killed and other 1,440 wounded during clashes. Those held include two army generals, Turkish media say. Explosions and firing were heard in key cities on Friday night, July 15, and thousands heeded a call by President Recep Tayyip Erdogan to rise up against the coup-plotters. The authorities also said 104 suspected coup-plotters had also been killed. Some 2,745 Turkish judges have also been dismissed in the wake of the coup, state media say. They are reported to include a member of Turkey’s top court. President Recep Tayyip Erdogan has blamed a “parallel structure” – a reference to Fethullah Gulen, a powerful but reclusive US-based Muslim cleric whom he accuses of fomenting unrest. Fethullah Gulen has rejected any suggestion of links to what happened, saying he condemned “in the strongest terms, the attempted military coup in Turkey”. The Turkish government wants Fethullah Gulen’s extradition. 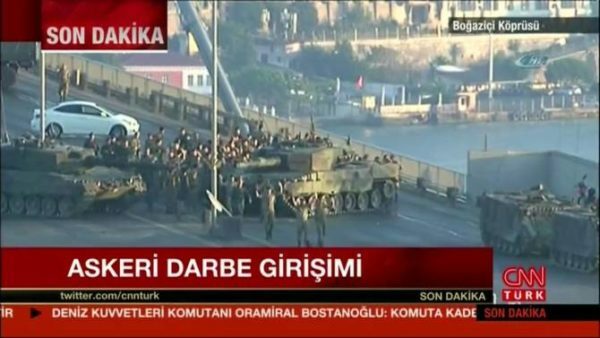 Events began on July 15 as tanks took up positions on two of the bridges over the Bosphorus Strait in Istanbul, blocking traffic. Troops were seen on the streets and low-flying military jets were filmed over Ankara. Shortly after, an army faction issued a statement that a “peace council” was running the country, and it had launched the coup “to ensure and restore constitutional order, democracy, human rights and freedoms”. President Recep Tyyip Erdogan, then in the south-west resort of Marmaris, made a TV address via his mobile phone, urging people to take to the streets to oppose the uprising. During the violence, the Turkish parliament and presidential buildings in Ankara were attacked. Gunfire was also heard outside Istanbul police headquarters and tanks were said to be stationed outside Istanbul airport. Broadcaster CNN Turk was temporarily taken off air after soldiers entered the building and tried to take it over. CNN Turk later tweeted a photo of soldiers being arrested by police. There were reports of fierce clashes in Taksim Square in central Istanbul, and gunfire and explosions were heard near the square. One of the helicopters being flown by rebels was reportedly shot down by government troops in Ankara.